On 'White Fear Being Weaponized' And How To Respond White people have called the police on black people in multiple incidents recently, despite no crimes being committed. Professor Khalil Muhammad thinks it's a problem with a complex history. 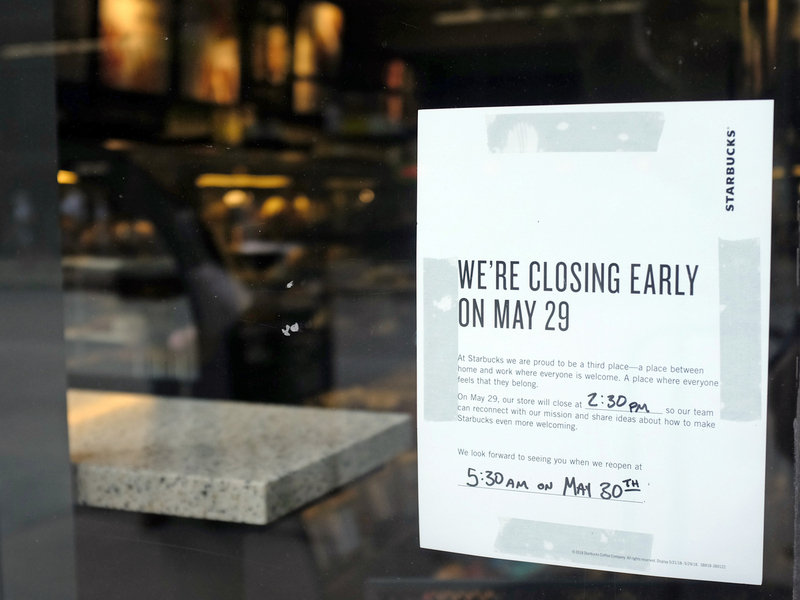 A sign is posted May 25 in the window of a Starbucks store, in Chicago. Starbucks will close more than 8,000 stores nationwide on Tuesday to conduct anti-bias training for employees. Starbucks is responding to the incident at its store by closing all of the chain's more than 8,000 locations around the country for some of the day on May 29 for racial bias training. "I think that we have to be careful not to say the scale has increased," says Khalil Muhammad, a professor of history, race and public policy at Harvard University. "What has definitely increased is the amount of video evidence, the amount of copy — meaning what journalists are writing around these issues — and even the organizing around trying to do something about it." He adds, "What we can know for sure is that we are having a national dialogue about it that is much more significant and increased in the number of participants in that dialogue than I've certainly seen in my lifetime." Muhammad talked with NPR's Lulu Garcia-Navarro about how cellphone video and President Trump have affected how white and black people interact with police. The stakes seem to be much higher in our highly charged partisan moment. Our current president ran as a "law and order" candidate in a country with a long history where the notion of using the police as the foot soldiers of controlling African-Americans, limiting their freedom, deciding that they are indeed second-class citizens and enforcing those laws when they were legal in this country is a really big part of the problem. And to evoke that mantra, to run on that mantra, to elicit the support of the entire community of professional police agencies means that we've now got citizens who are playing out this policy choice — this set of politics. On one side of this, where citizens feel that it's OK to be afraid of potential black criminals, or brown ones, or Native American ones — they are not feeling like they are going to be censured for that. So that raises the possibility that more people will pick up the phone, or threaten. On the other side of the ledger, people who were fighting against this kind of ethos in our country — this very punitive, racialized ethos — want to resist this now, so they're much more likely to pull out their cellphones ... and because of cellphone video and its ubiquitous role in this conversation, all of us are bearing witness to the problem. Policing in general, it's got to begin to reflect on the fact that people who they've been policing under various forms of zero-tolerance policies or "broken windows" policies has created tremendous mistrust — and done tremendous harm in those communities. And as such, every police encounter between a white caller and an African-American or Latino suspect doesn't come with a blank slate. It comes with a history. It comes with a present. And police agencies have to develop new training protocols that deliberately deal with that. I like to think that we could imagine a situation where these nuisance calls are quite distinctly handled from emergency phone calls. We've got to come up with some policies that raise the costs of bad behavior — of treating people differently than you would want to be treated. And that is a problem of white fear being weaponized, and that is a problem of police officers being a little too prickly when people are upset about having been judged harshly or inappropriately.